Red-ring milkweed (Asclepias variegata) of the Dogbane (Apocynaceae) family, formerly of the Milkweed (Asclepiadaceae) family, occurs in the U.S. from eastern Texas and Oklahoma to Illinois and east and south to the borders. It occurs throughout much of Arkansas except for small areas in northwest and east-central parts of the state. The genus name commemorates Asklepios, Greek god of healing and medicine. The specific epithet denotes the variegated flowers, specifically, a white flower that typically has a reddish ring. Another common name for this plant is “white milkweed”. 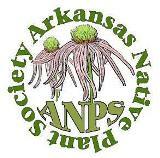 Thirteen additional species in the Asclepias genus occur in Arkansas. This perennial plant thrives in dry to moist, loamy to rocky open woodlands and edges of woodlands as well as sunny glades. Plant numbers in an area are generally low, with each plant typically isolated from others. All leaves and a terminal flower cluster are apparent soon after a stem appears in early spring. The 3-foot tall, smooth and unbranched stems bear 5 to 7 opposite, widely spaced large upper leaves as well as several pairs of smaller lower leaves which drop early. Stems, petioles and main leaf veins are reddish in spring but become more green during the growing season. As typical for most species of milkweeds, stems and leaves of red-ring milkweed, which are mostly glabrous (hairless), contain white sap. Photo 1: New stems appear in early spring with the developing inflorescence already visible at top. Photo taken in mid-April. Oval to oblong leaves, large relative to plant height, are up to 6 inches long and 3 inches wide with smooth margins and 1-inch petioles. Leaf margins are slightly wavy with a broadly rounded apex with an abrupt short tip. Leaves have a broadly rounded to gently tapered base, and leaf blades are mostly flat, facing sunlight. Leaves, which appear slightly waxy and feel leathery, are medium green above and lighter green below. Principal veins off midrib, almost perpendicular to the midrib, are prominent and widely spaced. The inflorescence, in the form of several umbels along the growing stem, begins immediately above the upper pair of large leaves. Umbels, tightly clustered at first, become separated as the plant grows. The first umbel is produced at a node bearing a pair of large leaves. From this point, the stem continues with several additional umbels from nodes with greatly reduced leaves. Small linear bracts occur at the base of umbels which fade as flowers open. Umbels, with 15 to 30 flowers on light green, short pedicels, are round-topped and held upright. Flowers may be loosely to tightly spaced depending on plant’s age and habitat. When umbels first become discernible, a loose calyx composed of five light green lobes can be seen surrounding tiny light green flower buds. As flower buds enlarge, they change from light green to white and the calyx becomes hidden. 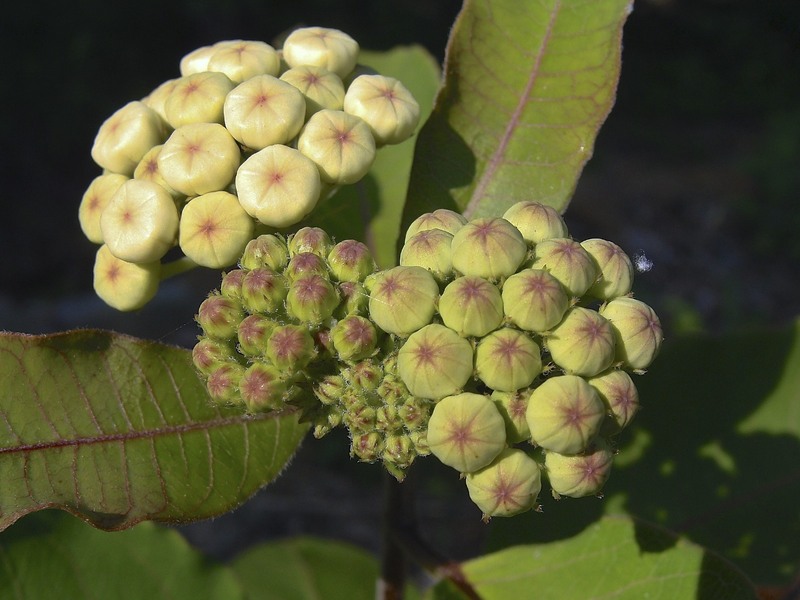 Tops of flower buds are pinkish with a star pattern where petals meet. At bloom, umbels may be up to 3 inches across on peduncles up to 1 inch long. Flowers are up to ½ inch wide and on pedicels about ½ inch long. Photo 2: Four umbels are shown with the least developed one being sited at the end of the growing stem. Calyxes, especially noticeable on the least developed cluster, become hidden as flower buds enlarge. Photo 3: Elevated hoods and horns cause foraging insects to inadvertently place their feet into stigmatic slits. Photo taken in mid-May. Milkweeds have unusual flower morphology and a complex pollination process. 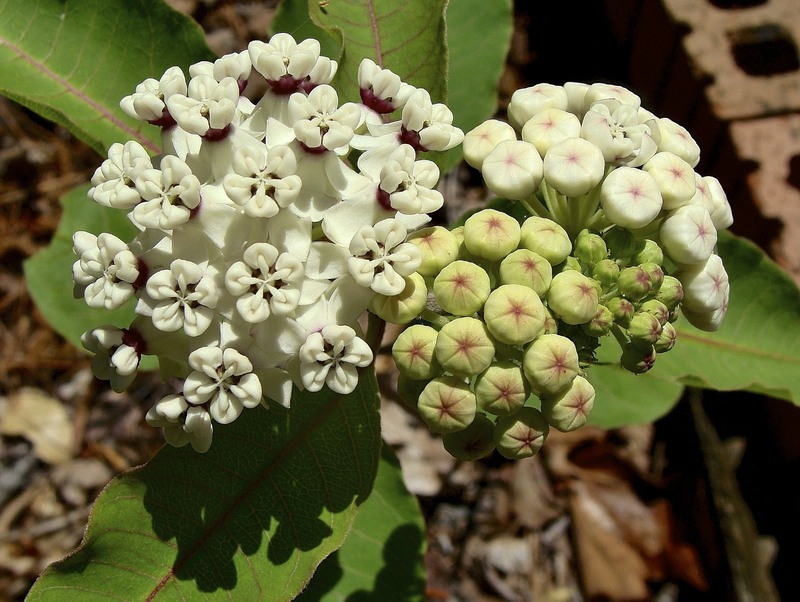 A red-ring milkweed flower has a corolla composed of five reflexed white lobes, a corona composed of five white elevated hoods (nectar chambers) with exserted, inward-pointing white horns and a short, unique central structure, the gynostegium. The gynostegium consists of the staminate and pistillate parts of the flower fused together. It bears five stigmatic grooves or slits through which pollen can come into contact with receptive areas of the true stigma. Fused stamen filaments form a tube, the column, that surrounds the lower portion of the gynostegium. The upper portion of the gynostegium contains five anthers, each with two chambers, in which the pollen grains are cemented into masses called pollinia. Adjacent pollinia (from adjacent anthers rather than from the same anther) are connected to a “clip” via wiry connecting arms (translator arms). Five clips are positioned at the tops of the five stigmatic slits, between the hoods. Two ovaries are found within the column at the base of the gynostegium. For successful pollination to occur, a clip with its attached pair of pollinia is accidentally jerked out by a foraging insect. Subsequently, the insect inadvertently inserts one of the two pollinia into the stigmatic slit of a second flower. The pollen grains in the pollinium then grow tubes to the 100 or so ovules in one ovary whereby seeds are produced. * A typical red-wing milkweed can produce a hundred or more flowers in several umbels, but generally few pods develop on a plant. Photo 4: The last umbel is in bloom on this stem. Note that flowers of lower umbels have fallen to expose stubby peduncle tips. Seed pods have not developed on the exposed peduncles. Photo taken in early June. 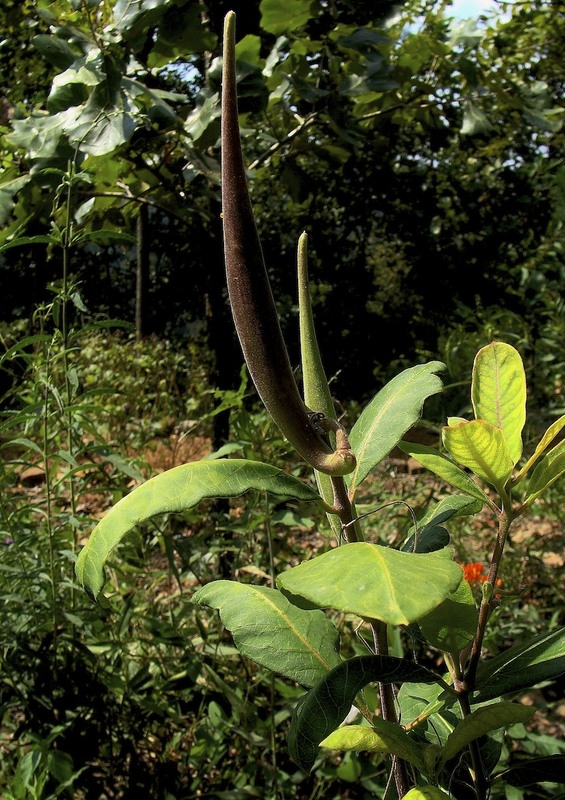 Seed pods are slender and erect with a length of 4 to 5 inches and width of ¾ inch. When mature and dry, pods split along a seam which exposes enclosed flat, circular and overlapping seeds. Seeds have white, silky, filament-like hairs that fill the remainder of the pod. Exposed hairs become fluffy in drying wind and sun. The wind pulls the seeds out of pods one-by-one for nearby or long-range dispersal. Photo 5: These immature seed pods show the characteristic shape of red-ring milkweed pods. Photo taken in mid-August. 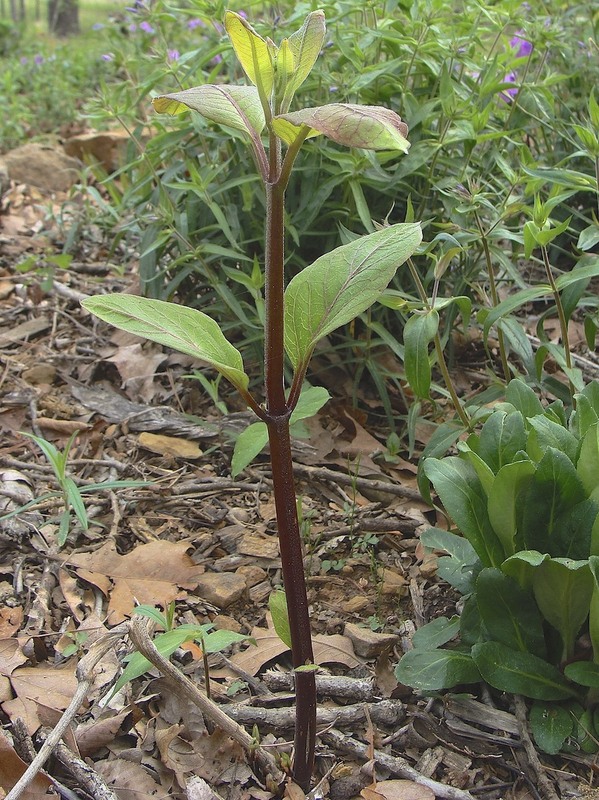 In partially shaded gardens, red-ring milkweed would be a “stand-out” plant that is well-behaved. With its large simple leaves with highlighted veins and showy flowers, it has pronounced structure. The writer has observed that red-ring milkweed, in comparison to some other native species, is not a favored host plant of monarch butterfly caterpillars, and also that it does not appear to be heavily preferred by deer. *Pollen tubes grow out of pollen grains from the convex edge of a pollinium. A flower cannot self-pollinate. An insect must accidentally insert a pollinium into a narrow but empty stigmatic groove. The translator arms are critical in getting the pollinium properly oriented for insertion: they rotate 90 degrees as they dry, bringing the sharp, convex edge of the pollinium (rather than the broad flat surface) to a position that allows “easy” insertion into the groove. 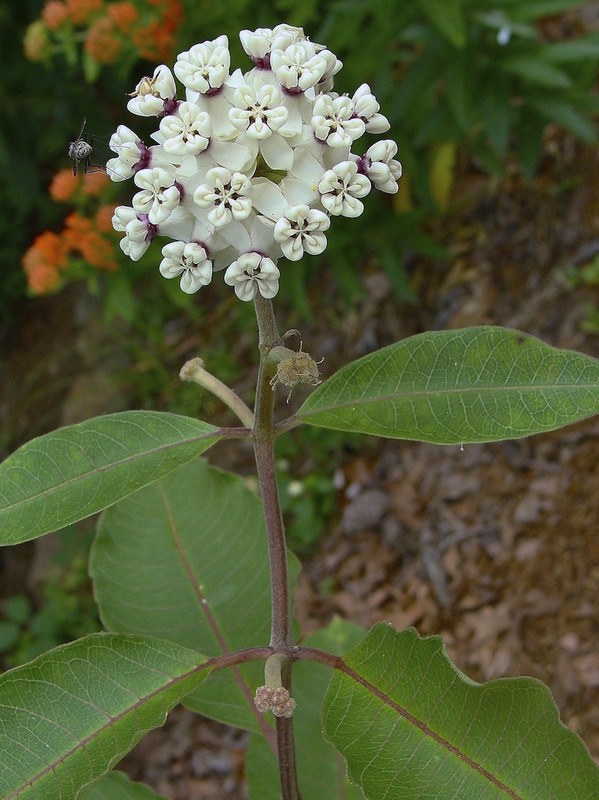 This entry was posted in Know Your Natives, Native Plants, Wildflowers and tagged Apocynaceae, Asclepias, Asclepias variegata, Know Your Natives, Milkweed, Red-Ring Milkweed, White Milkweed. Bookmark the permalink.